I’ve squirreled myself away to a writer’s retreat for a few days. I’ve been to a couple of them in my time. 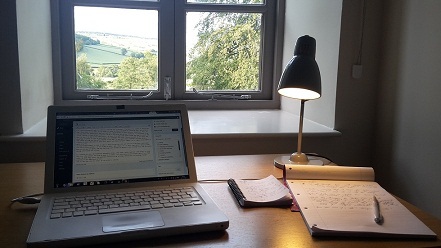 Even alone in a cabin in the woods helps to free the mind from distractions and focus on a writing task, but writers’ retreats have the added bonus that you have the companionship of other writers around you. This, of course, can be a risky thing! Creatives can be a very wild and unruly creatures. I’m fortunate to be able to say, I’ve had no bad experiences. In fact, I’ve made some good friends and kept in touch. The advantage of being in such an environment far outweighs the risks. You get to meet up for meals and chat about writing and the work problems of the day, so you don’t feel isolated. And when writers scatter to their own cells to work after meals, one feels one must comply. It is a great environment in which to write. The big disappointment is that it takes so long to get the city and work out of my hair, and to get into the writing routine – if not frame of mind – and once I have it’s a short time until I have to head back to the day job again, and the challenge then becomes maintaining that writing focus and discipline during life beyond the retreat. Wondrous will be the day when my time will be for one thing only – writing. I slightly envy writers that can write at the drop on the hat, on a train, or in a noisy cafe. Not I. As I looked out over the beautiful Shropshire hills, with swallows launching and docking in regular sorties, it all took a while (and not a few walks) to seep into this city-slicker and draw me down to a slower, less distracted state of mind. Once I’m in that state, my head then enters the parallel universe of my writing, and my real surroundings become scarcely of any importance at all, with the worlds in my head receiving all attention. That is the joy, and the irony, of the writer’s retreat. Forget Superman – only Justin Bieber can save us now! While the Euro hurtles towards collapse, there is hope for the world, in the form of … Justin Bieber. Who could have forseen such a day! Snow drifts and financial storms happen for a reason. Trouble brings people together. Sorry I haven’t been keeping up the blog this last week. I said I would have some articles to put up on it, but life got in the way. Work and illness. 2009 has been, without doubt, the second worst year of my life. I haven’t said much about it during the year, because I don’t like to complain, and it would be tiresome to hear it too. But I always look for meaning in even the bad things that happen to us. This year, I have learned to be sympathetic to those in pain, in a way that you can only when you’ve experienced pain. I hope to bring that sympathy with me through to 2010 and beyond. As much as I can find purpose in this dire year, I really want a better one for next year. Come January, I plan to set about making it just that. This year I learned something about my writing too. I’m not as talented a writer as I thought I was. Actually, it’s not that I thought I was hugely talented (in some vain way), it’s that I just always assumed I had what it takes to “make it”. In the end, despite what anyone will tell you, publishing, like life, is a bloody lottery, even though you do your best. What I do about that in 2010, we’ll see. For now 2009 is limping to a close, and me right along with it. I’m exhausted. Blindsided by a bad year that came out of nowhere. And a stomach bug over Christmas too, just to see out the year consistently! But I’m looking forward to the new year of hope. I won’t wish you all a happy new year, because we can’t know what will come our way. However, I wish that you learn to have a good 2010, in all its sorrows or joys.